Synthetic peptide corresponding to Human APAF1 aa 1158-1177 (C terminal). Our Abpromise guarantee covers the use of ab2000 in the following tested applications. IHC-P Use a concentration of 20 µg/ml. WB 1/500 - 1/2000. Predicted molecular weight: 130 kDa.Can be blocked with APAF1 peptide (ab7872). Oligomeric Apaf-1 mediates the cytochrome c-dependent autocatalytic activation of pro-caspase-9 (Apaf-3), leading to the activation of caspase-3 and apoptosis. This activation requires ATP. Isoform 6 is less effective in inducing apoptosis. Ubiquitous. Highest levels of expression in adult spleen and peripheral blood leukocytes, and in fetal brain, kidney and lung. Isoform 1 is expressed in heart, kidney and liver. The CARD domain mediates interaction with APIP. 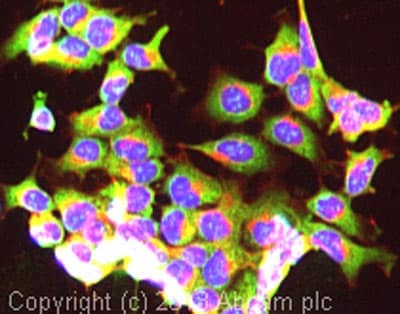 ICC/IF image of ab2000 stained HEK293 cells. The cells were 100% methanol fixed (5 min) and then incubated in 1%BSA / 10% normal goat serum / 0.3M glycine in 0.1% PBS-Tween for 1h to permeabilise the cells and block non-specific protein-protein interactions. The cells were then incubated with the antibody (ab2000, 5µg/ml) overnight at +4°C. The secondary antibody (green) was ab96899, DyLight® 488 goat anti-rabbit IgG (H+L) used at a 1/250 dilution for 1h. Alexa Fluor® 594 WGA was used to label plasma membranes (red) at a 1/200 dilution for 1h. DAPI was used to stain the cell nuclei (blue) at a concentration of 1.43µM. 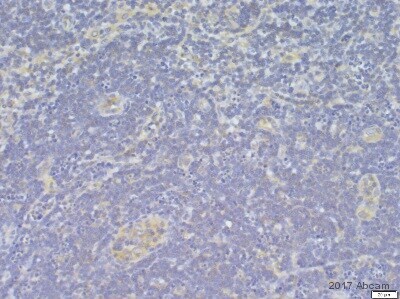 Immunohistochemistry of Apaf1 in human skin tissue with Apaf1 antibody at 20 µg/ml. Publishing research using ab2000? Please let us know so that we can cite the reference in this datasheet. The Abcam Order # is**********. For ab32351 and ab2000 customer would like to receive ab59388 and ab2001 as replacements. For ab93942she agreed to submit an Abreview, I asked her to create an account on Abcam's website and submitthe Abreview. She said she is already doing it. I have processed your request to receive the 2 free of charge replacements and below is the testing discount code for ab93942. I am very pleased to hear you would like to accept our offer and test ab93942 in rat tissue. This code will give you 1 free PRIMARY ANTIBODY before the expiration date. To redeem this offer, please submit an Abreview forrat tissue and include this code in the “Additional Comments” section so we know the Abreview is for this promotion. For more information on how to submit an Abreview, please visit the site: www.abcam.com/Abreviews. I am sorry that the customer has had problems with these antibodies. As we guarantee thatboth ab2000 and ab32351 to work in western blot on rat tissue and they are not working as we expect then I am happy to either replace or refund the cost of these antibodies. We have multiple other antibodies against these targets and I would be happy to send you any of those. As ab93942 was only predicted to work in rat, then it does not fall under our Abpromise, but what I can do is offer them a back dated testing code. They would have to submit anAbreview on how the antibody performed and once that Abreview was submitted, they would be able to use the testing discount code to get another antibody free of charge. Please let me know how you would like to proceed and I will be happy to resolve this issue for you. Customer is getting no bands with 3 different antibodies (ab93942, ab32351 and ab2000). Please, find below the questionnaire filled out by the customer. Let me know if you need further information. We can’t see bands for all antibodies. Wistar rats’ brain (hippocampus, cortex and striatum). For the first time, the extraction was made with RIPA buffer with protease inhibitor. After, we tried a different extraction (for mitochondrial and cytosolic proteins → 10mM Tris-HCl pH 8, 1mM EDTA pH 8, 100mM NaCl, protease inhibitor cocktail, 0,5% Triton X-100 and 0,1% SDS). For the first time we tried 25ug of protein. After, we performed a protein curve, using 20, 40 and 50ug of protein. We also tried to boil the sample to facilitate the binding of antibodies. Acrylamide gel 10% and 12%, SDS-page, electrophoresis for 2h / 2h30 at 80 / 100v. Transfer was made on ice for 2h at 350mA; 2h at 50mA; 2h30 at 85mA; 2h30 at 100mA; 3h at 100mA. Membranes were blocked with skim milk 5% for 15 minutes or albumin 5% for 30 minutes. Caspase 3 (ab32351) = 1:5000, 1:3000, 1:1500, 1:1000, 1:500. APAF1 (ab2000) = 1:1000 and 1:500. All antibodies were incubated overnight, on ice, shaking. After, the membranes were washed with TBST 1X (6x for 5 minutes). The secondary antibody used was Goat pAb to Rb IgG (HRP) – ab6721. The concentration was 1:2000 for 1h on ice, shaking. After, the membranes were washed with TBST 1X (6x for 5 minutes). First, we used Western Lightning ECL kit – Perkin Elmer. 500uL and 1000uL of each reagent and exposure for 1, 2, 3, 10 and 15 minutes. We also used 500uL and 1000uL of ECL Western Blotting Substrate Kit (ab65628) for others tests and exposure for 15 seconds, 30 seconds, 1 minute, 1.5 minutes and 3 minutes. We used marker all the time and used an optimized antibody to check if our sample was ok.
14) How many times have you tried the Western? For DNM1L we tried 5 times. For caspase 3 we tried 7 times. For APAF1 we tried 10 times. 15) Have you run a "No Primary" control? 16) Do you obtain the same results every time? e.g. are the background bands always in the same place? Yes. All the time we can’t see bands. 17) What steps have you altered to try and optimize the use of this antibody? We changed all the steps of Western Blotting. We prepared new samples with two extraction methods, we changed the gel preparation, we changed the electrophoresis and transfer buffer, we changed blocking agent. We also checked if our samples in electrophoresis and transfer were ok, using Coomassie blue dying to visualize the proteins. We also tried different antibody dilutions as well as protein loading concentrations. I am sorry about the problems that you have been having in western blot, with some of our products. Based on the information you have provided, I suspect that the problem is with the secondary antibody, since it would be really bad luck if you had all 3 primary antibodies fail to work, although for ab93942, we only predict that it will work in rat tissue, as we have not tested it rat yet. I would be happy to send you a new secondary antibody to see if that resolves the issue. Also, under our Abpromise, both ab2000 and ab32351 is guaranteed to work in western blot on rat tissue, therefore if it does turn out that the primary antibody is at fault, then I would be happy to replace or refund the cost of these antibodies. If you would like me to replace the secondary antibody, could you please provide me with the original order information for this product and also let me know if there is any particular secondary that you would like to receive. I look forward to your reply and helping you to resolve this issue. You sale two different antibodies for apaf-1. Could you explain the difference? They are CT and NT. Please send 800 number also.